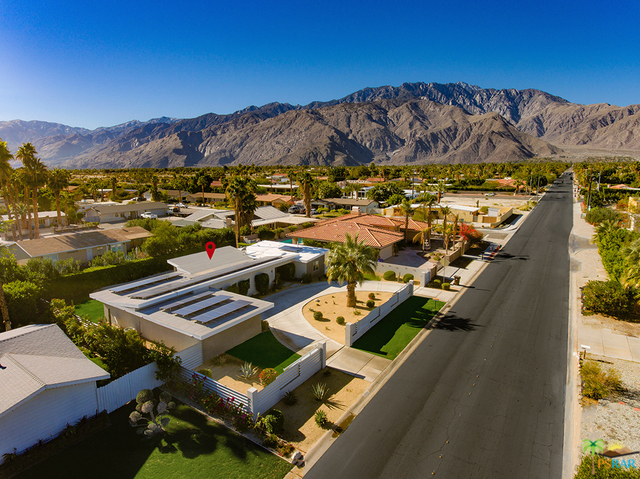 Dazzling and marvellous Mid-Century modern SFH in Palm Springs with incredible indoor-outdoor living. This stunning spacious 3BD/3BA (2 En-Suite Bedrooms), 1, 874 Sq Ft on 10, 019 lot, South facing (great exposure during Winter), incredible mountain views, your own pool, circular driveway, has gone through an extensive renovation/remodeling about 5 yrs ago: new roof, new heating/AC, water heater, new kitchen, new bathrooms, new paint (as off last year), new landscaping, exterior & interior lighting, new pool heater, in-ceiling speaker system outside & inside, fans & misters, solar electrical panels (leased, reducing electrical bills by 60%), tiled floors, high-end Fabrica carpet in the bedrooms. Very private yard w/mature landscape. Covered patio. Low maintenance. You own the land, no HOA dues. Perfect for primary/2nd home/vacation rental. Short distance to Uptown/Design District, Downtown, Shopping, Restaurants, Gym, Cafes, Art Galleries, Museums, Casino, Golf, Tennis, Parks, Airport.